We are swamped by information. The media loves to tell us the latest findings about human nature. But if we are not careful we are like the person who peers so closely at a grain of paint that they miss the painting. When we stand back and see how things might all fit together into the whole of human nature we can make better use of the constant diet of psychological morsels we are fed. In this occasional series I try to do just that. I aim to, at least a little, contextualize recent research findings so that we don’t just get mere threads (to jump around a bit with my metaphors) but something more of the whole tapestry of understanding. Sometimes we need less not more to understand. Sometimes we need to stand back a bit. We are a culture that likes to dissect minutely but doesn’t always get a sense of the grand totality of what we study. Disparate facts do not create wider meaning. I have tried to communicate something of what it means to be human and develop problems or what goes wrong when we try to meet our needs in ways which produce evil for us and others. Perhaps as a culture we don’t need more information but more time to digest and process and use what we already have. Yes we need the detail but we also need the wide canvas. Here I simply try to contextualise some of what researchers find. I may be wrong and certainly my ideas will be incomplete but I hope they can serve as some kind of a starting point. So what am I looking at this time round? This week we will be looking at the dangers of evening stress, lack of sleep and anger, social media usage and body image in young women, the antidepressant effects of Skype and the creation of imaginary worlds in children. Enjoy! Summary: Stressful events in the evening release less of the body’s stress hormones than those that happen in the morning, suggesting possible vulnerability to stress in the evening. Chill in the evening. That seems to be the message from our first piece of research. Night time should be the right time to wind down, kick back and take it easy before descending into blissful sleep. Well that’s the idea anyway. Research1 written up in the exciting sounding Neuropsychopharmacology Reports describes how 27 healthy volunteers were used in the research. They all had normal day time work hours and sleep habits. Lead researcher Yujiro Yamanaka stress tested one lot of these subjects in the mornings and another group in the evenings. They had to prepare and give a presentation and do timed mental acuity tasks. What the researchers found was that the “hypothalamic-pituitary-adrenal” (HPA) axis reacts differently to acute psychological stress according to the time of day. What this means is that those stress tested in the evenings were physically less able to deal with the stress and therefore damage from evening stress may be greater because we may not deal with it so well. From blood pressure variation throughout the day to alertness, time of day impacts how we experience our lives. Our evening habits matter. Perhaps the effects of stress being worse as night descended was an evolutionary adaptation to help encourage us to hunker down in safe shelters as the shadows of night deepened and the predators descended. We already know that screen time at night is associated with damaged sleep, which is associated with all kinds of health problems2. So treating evening as evening, rather than some extended daytime may help us in all kinds of ways. Developing a reasonably calm evening routine for our stressed clients may be instrumental in helping them in all kinds of ways. And talking about sleep, have you ever noticed how grouchy you can feel when you haven’t slept well? It seems there are good reasons for that. Summary: Losing just a couple hours of sleep at night makes you angrier, especially in frustrating situations, according to new research. While the results may seem intuitive, the study is one of the first to provide evidence that sleep loss causes anger. The research also provides new insight on our ability to adjust to irritating conditions when tired. Yes this one does seem kind of obvious. But new research3 shows what we all knew to be true. Other studies have found a correlation between disrupted sleep and increased anger but this latest one shows that fractured sleep can cause anger. The research was done by giving subjects tasks to complete whilst subjecting them to irritating noise. Those who had suffered sleep disruption were much more angered. Krizan says that their research shows sleep loss uniquely impacts anger. In other words it’s not just a result from feeling more negative in that moment. If someone is chronically sleep starved then this can impact their emotional balance, in turn corroding their relationships and work life not to mention their physical well being. But what might it be about poor sleep that produces anger particularly? It’s generally thought that positive emotions like joy and satisfaction occur when the prefrontal left lobe of the brain is activated and indeed this part of the brain seems to be underactive during a depression blocking the person off from good feelings4. Curiously though, during anger the left hemisphere is strongly activated5. It might be that this is because anger is a toward emotion (like lust and greed) and therefore not an away from emotion such as fear or disgust in which we are compelled through the motion of emotion to flee the focus of our attention. So in that sense anger might be a positive emotion in that it compels us to act positively, to move toward our focus, (even if that has negative consequences!) rather than to move away from it. The left hemisphere in the brain is also often associated with logical processing. People, though, tend to become dumber the angrier they get (and sometimes lament their stupidity later when they’ve calmed down). But despite the brain power lowering effects of anger, people do use a kind of simple minded logic when they are angry – but the context-processing right hemisphere is all but dumped in the moment. It seems logical, in the moment, to lash out, if any thought is involved at all. But the wider context (this is your best friend’s wedding!) may not be appreciated in that moment. Without access to wider context, the logic of anger, like the logic in a dream which is also cut off from wider context, can make people do things that “seem like a good idea at the time.” It may be harder to utilise both sides of the brain when we are sleep deprived. Certainly we may need to teach clients anger management and a part of that may need to be a direct focus on improving their sleep. Summary: Young women who regularly view social media images of friends who they think are more attractive than themselves report feeling worse about their own appearance afterward, a new study shows. This research was conducted at York University6 and compared the perceived body image after young women had interacted with a family member on social media or an attractive peer. It’s no secret that social media can blur the lines on what’s real and what’s fantasy, but new research now shows how young women interact with images online can affect how they feel about their own bodies. Most of us, at least in some ways, compare ourselves with others. High or low self esteem either correlates to how we feel we compare to others in a general way (they are a better person than me/everybody is better than me) or specifically (they are more attractive/richer/smarter than I am!). If we don’t build too much of our sense of worth around physical beauty then feeling others are more beautiful won’t damage self esteem particularly. But if we are largely invested in appearances then it will affect us more as a general feeling of inadequacy. Before social media we had maybe a few classmates or locally living peers to compare ourselves to. Now we can scroll through the carefully airbrushed pouting faces and toned bodies of countless ‘friends’ online. It does seem that too much time on social media is unhealthy and, ironically, correlates with a sense of loneliness7. Updates on social media may be more about appearance than, say, the content of someone’s thoughts. So perhaps social media use is encouraging objectification between peers and of the self. Mind you some forms of technology seem to help older people feel happier. Summary: Researchers compared four different types of online communication technologies – email, social networks, instant messaging, and video chat used by people 60 years and older. They then gauged these people’s symptoms of depression. The study8 found that people who used video chat functions such as Skype and FaceTime had almost half the estimated probability of depressive symptoms compared with older adults who did not use any face to face real time communication technologies. The researchers at OHSU (Oregon Health and Science University) used data from The Health and Retirement Study supported by the National Institute on Aging of the National Institutes of Health. In total 1,424 participants were identified who had filled in a questionnaire about their use of communications technology. These same participants also completed a survey two years later which measured, among other things, any depressive symptoms. Those who used social media platforms like Facebook, instant messaging or email had practically the same rates of depressive symptoms compared with older adults who used no communication technologies whatsoever. In contrast, researchers found that these older people who regularly used video chat functions such as FaceTime and Skype had around half the estimated probability of depressive symptoms, after adjusting for other factors, such as pre-existing levels of depression. It seems that isolation and loneliness can have terrible mental and even physical consequences ranging from depression to cardiovascular problems9. Couple this with an older, and in some ways more vulnerable, population and lack of human contact can be a terrible cross to bear. I have seen first hand the antidepressant and sense of meaning enhancing effects of social connection and the maintenance of intimate relationships via this kind of technology. Okay so much for the online worlds. But what about the worlds we ourselves create? Summary: Children who create imaginary parallel worlds known as paracosms, alone or with friends, are found more commonly than previously believed, according to a new study. Apparently research on childhood creation of alternative worlds, known as “paracosms” has been done before10 but it focussed on adulthood recollection of childhood alternative universe creation. These earlier researchers considered the creation of childhood worlds, with imaginary friends and landscapes, to be rare. The age range of the subjects in these studies is around 8 to 12. This latest study11 into paracosm creation finds it to be much more common than was previously thought. Neither verbal acuity nor gender were found to have any relation to children who reported experiencing imaginary friends and the creation of imaginary worlds. Interestingly the researchers also found that paracosm creation was far from always being a solitary activity and often friends co-created these imaginary worlds which all featured geographical elements (such as a fountain of honey). It was found, not surprisingly, that children who created these worlds were more creative than those who didn’t. I love the term these researchers use to describe imaginary worlds, ‘paracosm’, which itself conjures up a sense of a parallel universe. What with so many worlds created for us in film and online it feels refreshing to me to learn that the natural instinct to create imaginary realities is still part of childhood. I think it is an innate human trait to feel compelled to create or contact hidden realms of reality. Creating complexity without confusion, seeing how things fit together, creating story arcs. What could be more human? And perhaps this is the beginning of the religious impulse which can manifest as political utopianism as much as mystical yearning. I can’t help wondering what J.R.R. Tolkien was like as a child. Or Ursula Le Guin or C.S. Lewis or George R.R. Martin. But something else occurs to me. In a sense, many of us create imaginary worlds. We imagine what others think of us. We imagine we can’t or shouldn’t do or say things when, if we did but dare, it might go well for us. And we imagine that the way we see things is inevitably the way they are. At least the children in this study knew their worlds were imaginary. Perhaps as adults we need to create a similar level of awareness. We all create and live by stories. We are the stuff of stories, but we’d better be careful what stories we create and live within. 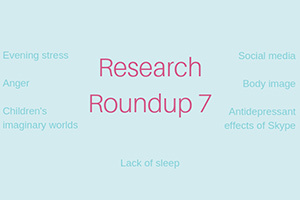 I hope you have enjoyed this edition of Research Roundup. I would love to hear any thoughts you have on these recent studies in the comments below. This client has quite recently given birth to twins (a year and a half before the session). She found she effortlessly ate healthily during and after the pregnancy but since going back to work for three days a week she has a real problem with sugar consumption. Mark works to reframe the sugar as bad in all kinds of unfamiliar ways but he is careful not to deliver these ideas like some kind of lecture. He reframes sugar as a ‘thief’ and ‘con artist’ and builds up the client’s psychological resources in order to move beyond excessive sugar consumption. Uncommon Practitioners TV members can view this session now, and if you’d like to sign up, click here to be notified when UPTV is open for new members.